Does the Campfire Defender Kit Really Work? Summer time is the time to be outdoors and enjoying all that it has to offer. This means taking advantage of those beautiful summer nights and no better way to do that than with a campfire. The Campfire Defender Kit is a product that may really be able to boost up this experience. With camping season not far from beginning, we looked for the latest in cool gear for the outdoors lovers among our readers and found a product that was so unique and different that we decided we would have a look at it. The Campfire Defender Kit is a revolutionary new product that is designed with multi-purposes in mind. The claim is that by using the Campfire Defender Kit you are able to control the campfire you have set while you are camping. The ability to control your fires when out in the bush is important for a variety of reasons that we will further explore below. The hype surrounding the Campfire Defender Kit comes from the ability of the kit to truly give you all you need to completely control the fires you start while out experiencing nature in all its glory. The cost of the Campfire Defender Kit is $249.95. While this may certainly seem a little steep when you consider what you get, how long it will last, and the function it performs it really is not that steep of a price to pay especially if you live in certain parts of North America. Other than the commitment to using the product while you are camping there is really not much commitment required for this kit. The pack it comes with is very easy to carry while camping or hiking and the easy to store when not in use. When you are camping, one of the things that makes the trip enjoyable is when the sun goes down and you get to start your fire and cook up some dinner of just hang out and make some marshmallows or S’Mores. The problem lies in the fact that in certain parts of North America especially since climate change has begun to further dry out particular regions making the likely hood of accidentally started forest fires much more possible. The Campfire Defender Kit is designed to cover the fire so that no ash or sparks can escape and start a fire. The other use for the Defender is cover the fire when you are heading to bed so that you still have a hot bed of coals to either cook on in the morning or to re-start a bigger fire to warm up and also cook with. The unit consists of the cover that is designed to last for 100s of separate fires, the stakes to set the cover up and the bag used to carry the unit in when not in use. The mat that covers the fire has a built in flue so that you can adjust the level of airflow meaning you can keep coals simmering or let the oxygen in and get a bigger flame. As anyone who loves camping knows only too well, getting a fire going in the morning is paramount to your comfort especially when it is a little cold in the a.m. at the start and end of the camping season or if camping at high latitudes. The Campfire Defender is fantastic for keeping those coals from the night before fire simmering enough for you to get a proper fire started without having to go through the fire starting process all over again as well the ability to control your sparks or ashes can mean the difference between protecting the area from unwanted forest fires. This Campfire Defender Kit does both of those things very, very well indeed. We are prepared to give the Campfire Defender Kit a thumbs up. For any serious camper who worries about the effect their campfire may have and for those who like the added bonus of being able to keep a fire going all night this Campfire Defender Kit for you. Great idea and fantastic product indeed. 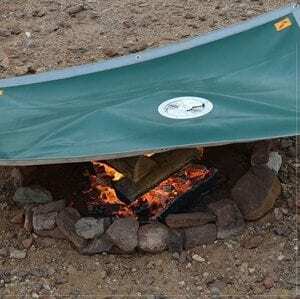 To help with your camping cooking needs check this camping cookware out. What do you think? Does the Campfire Defender Kit work or not? Does the Kymaro Shrug Shaper Really Work? Does the Bottle Cuddler Really Work? Does Flex Shot Really Work?